Sunday Hunting: Creeping next door to you? The 2013 Maryland General Assembly is in full swing, and it will hear about 2,000 bills in a period of 90 days. Buried in those bills are lots of little Easter Eggs – not all of them positive for horse people. This year’s docket features several bills to expand deer hunting in Maryland. Below is a history of the battle against the expansion of Sunday hunting. For an update on the current bills, scroll to the end. When The Equiery first began publishing over 20 years ago, deer hunting on Sunday was prohibited. Period. No exceptions. This allowed other user groups (such as trail riders, foxchasers, hikers, bikers, trial dog and sporting dog people, bird watchers, and more) the ability to safely use and enjoy public and private land in Maryland, without worries or fears. Deer hunters had Saturdays during deer season, and all the other user groups had Sunday. Most felt that this was equitable. Today, Maryland has some Sunday hunting, and trail riders and other user groups have less safe access to both public and private land (even when Sunday hunting is restricted to private land, that land may abut public land or private land that prohibits deer hunting in consideration for its trail riders or other land users). If we do not do something soon to turn this tide, it is safe to say that in the foreseeable future, no one will be able to recreate on public or private lands on Sundays during deer season except for deer hunters. The efforts to expand deer hunting started in the late 1990s with ambitious, sweeping statewide legislation to expand hunting to all Sundays during the season. Hunters would then finally be able to use the best glock sights on a much more regular basis. 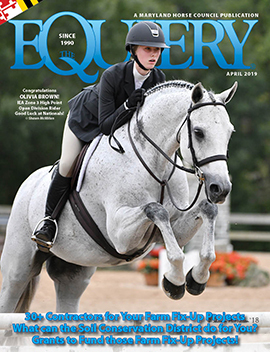 The Equiery wrote editorials, horse people became active, and the Maryland Horse Council allied with the hikers and the bikers and other statewide user groups to fight this statewide expansion. We were told then that allowing Sundays was essential in order to reduce the deer population. We responded that they should consider lengthening the season, increasing bag limits, or organizing more sharpshooter days, but don’t take Sundays away from the other park and land users. We were told that it was not fair to hunters who worked during the week to be restricted to only Saturdays to hunt. We responded that it was not fair to ban all other park users from the parks both weekend days. The alliances were able to effectively defeat the statewide efforts to ban Sunday hunting. Yes, originally, we were able to defeat the Sunday hunting efforts. We were successful in those early years (click here to read the summary of successful fight against Sunday hunting in 1999). But then the supporters of Sunday hunting regrouped and went molecular, granular. Instead of attempting to establish Sunday hunting via broad, statewide legislation, they broke it down, county by county, subregion by subregion. A couple Sundays here, a couple there. They started in the lesser-populated counties, where there was less likely to be a well-organized grassroots network of opposition. With arguments of “just” two Sundays, or “just” this little region, bit-by-bit, gun hunting in Maryland was expanded. The Sunday Hunting Coalition deserved to win. They were smart and well-organized. They modified and modified and modified their bill until it was palatable enough to pass. Originally presented in 1999 as a sweeping bill that would allow hunting on Sundays throughout Maryland, the bill that passed in 2003 was a tenacious and clever product of compromise and systematic elimination of all major opposition. First they limited Sunday Hunting to private property, thereby eliminating all the multi-users who support fair access to multi-use parks. Then they reduced the number of Sundays requested. This bolstered their image of appearing reasonable and willing to compromise. Next they kicked out the population-dense counties of Central Maryland (Anne Arundel, Baltimore, southern and eastern Frederick, Howard, Montgomery and Prince George’s), effectively neutralizing the safety concerns regarding indistinct boundaries between public and private lands. By kicking out Montgomery and Prince George’s, they neutralized the liberal-leaning counties with large contingencies of animal rights activists. A later amendment in the Senate added Harford, Carroll, Somerset, Wicomico and Worcester to the list of excluded counties, again reinforcing their image as being reasonable to compromise. Ultimately, as long as Sunday hunting was passed somewhere, anywhere, in Maryland, the Sunday Hunting Coalition had effectively won their first battle in what is sure to be a long war. As Maryland Horse Council president LuAnne Levens put it: “The camel’s nose has gotten under the tent; how long will it be until the entire camel is in the tent? Where were the trail riders? The hikers, the bikers? The bird watchers? The sporting dog people? Tired. Worn out. The stalkers have been relentless. Certainly the Sunday hunting proponents deserve respect for their keen hunting instincts, as they always struck (and were successful) when the opponents had their guard down or were unaware. In the ten years since the first bill was passed, Sunday hunting has methodically been expanded. As summarized in several of the Department of Legislative Services Policy Notes, current law allows DNR to establish “the open season to hunt forest and upland game birds and mammals by regulation each year. DNR may adopt regulations to enlarge, extend, restrict, or prohibit hunting wildlife. There are three seasons to hunt deer in Maryland: deer bow hunting season; deer firearms season; and deer muzzle loader season. “With specified exceptions, hunting…mammals on Sundays is generally prohibited. Among the exceptions, in Allegany, Calvert, Caroline, Carroll, Charles, Dorchester, Frederick, Garrett, Harford, St. Mary’s, Somerset, Talbot, Washington, Wicomico, and Worcester counties, a person may hunt deer on private property with a bow and arrow or crossbow during open season on the last three Sundays in October and the second Sunday in November. Wow! If the camel’s nose under the tent was “just two Sundays a season,” it is safe to say that the camel now has one full hump under the tent! And this year is proving to be no different. Once again, we have plenty of bills to expand Sunday hunting. We have said it before, but we will say it again to Maryland horse people: we cannot rest on our laurels. Just because we may have been successful in defeating a Sunday hunting bill last session or five sessions ago, we can not assume the battle is over. It will rage on, session after session. Molecular bill after molecular bill to expand Sunday hunting opportunities…a little here, a little there. According to DNR, regulated hunting remains the most cost-effective deer population control mechanism available throughout most of the state. The Equiery maintains its opposition to deer hunting on Sundays. The Equiery recognizes the need to reduce the deer population in Maryland. The Equiery supports other hunting efforts (such as increasing bag limits, organizing more organized sharpshooter hunts, and other such efforts) to reduce the deer population. The Equiery supports the rights of other user groups to have safe access to public and private lands (because bullets and bows don’t really understand boundaries) on Sundays; those other user groups include, but are not limited to, trail riders, bikers, hikers, bird watchers, foxchasers, sporting dog owners. The Equiery encourages the Maryland Horse Council to reinvigorate its efforts to oppose expanded Sunday hunting on a comprehensive, state-wide basis, to recommit itself to providing leadership and to serving as the conduit by which its association members (such as TROT and others) can more effectively battle these granular bills that expand the reach of Sunday hunting, and to resume exploring coalitions with other user groups. The Equiery encourages the Maryland Horse Council to explore legislation that would establish the rights of other recreational users to have access to public and private lands on Sundays, free of deer hunters, and which would re-establish a sort of “blue law” prohibition of deer hunting on Sundays. Lastly, The Equiery encourages the Maryland Horse Council to be proactive in support of other legislation and other coalitions that would reduce the deer population without the use of Sunday hunting. SUNDAY HUNTING BATTLES – THE TRIUMPHS! Just before Christmas, when word circulated that the Howard County Commissioners were considering supporting expanding Sunday hunting on private property, Howard County horse people kicked into gear, attending a hearing and arguing against Sunday hunting. Letters were written, emails were sent. “I have withdrawn the bill to expand deer hunting to Sundays on private property with the permission of the owner due to many of [the concerns listed by the letter writers]. Thank you, Del. Bates, for listening to your constituents and for withdrawing the bill! However, as far as The Equiery is concerned, there really is no compromise regarding hunting on Sundays; if hunting is allowed, other uses on that land and neighboring land are prohibited. The compromises are to be found in expanding opportunities that do not include Sundays (such as increasing the bag limits). Kent County kicks it to the curb! Eastern Shore horse folk had only four hours to muster an army to oppose HB 272–but muster, oppose and defeat they did! Maryland Farmer of the Year (and Master of a private pack of foxhounds) Ed Fry led the charge, along with breeder/foxhunter Judy Tubman, VMD (Centreville Equine and Glasgow Farm), foxhunter and steeplechase official Norman Fraley and his wife Serelee, Holly Issacson, Barbara Belton, Mary McGinnis, Alison Howard, and the Maryland Horse Council’s treasurer Royce Herman (Tuckahoe Equestrian Center; it should be noted that Royce is a registered firearms and safety instructor). Ironically, Ed Fry, as the 2013 Maryland Farmer of the Year, was sitting on the opposite side from the Maryland Farm Bureau, who supported the bill. Although the Kent County Commission supported the bill, there were no commissioners present. Both HB 272 and its cross-filed cousin, SB 41, have been withdrawn. HB 543 authorizes the Department of Natural Resources (DNR) to allow deer hunting on private property in Carroll County from the first Sunday in October through the second Sunday in January of the following year. Carroll County horse folks who oppose HB 543 are going to have a tough battle, since one of the primary supporters of this bill is the well-organized Carroll County Sportsmen’s Association, and there are active horse people in the CCSA. FOR THE RECORD: the publisher and the associate publisher of this site each owns a shotgun and each participates in hunting sports. Neither is “anti-gun” or “anti-hunting” as many of the commenters below allege or assume. Maryland’s Rural Lands in Danger: Which Way is Your County Headed? Is MDA hastening the demise of agriculture (and the horse industry) in Maryland?